The shop in Muchelney was built in 1967 on the site of the old pig sty. 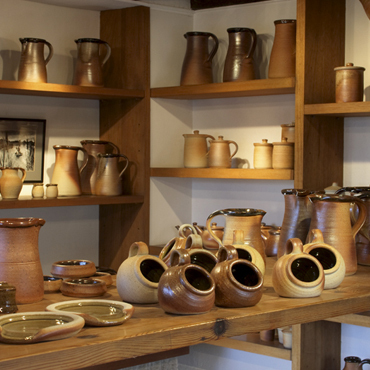 There is a display of all our kitchenware pots from the catalogue, as well as many more! The John Leach Gallery was built adjacent to the existing shop in 2003 and opened in 2004 with an exhibition of Marc Chagall. 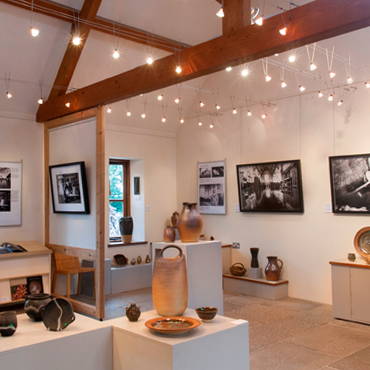 The gallery hosts a programme of exhibitions through the year and is keen to support West Country artists and craft workers. In addition to the guest artists there is a permanent display of the latest signed ceramics by John Leach, Nick Rees and Mark Melbourne. When you plan a visit to the pottery on the southern fringe of the ancient village of Muchelney, allow time to discover the secrets of the surrounding Somerset Levels... water-flanked lanes, thatch-roofed villages, beautiful churches, flourishing traditional crafts, grand houses and gardens, welcoming pubs and eateries - and a silence you can almost hear! 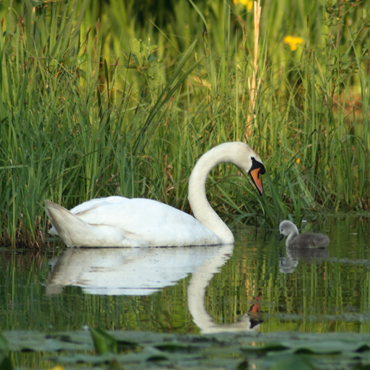 You may also like to explore and stroll around John's pond, a County Wildlife Site which has been featured several times on television. The site stretches over 9 acres and has been landscaped by planting 4,000 broad-leafed trees native to the area in 1990.... but if it's wet, don't forget your wellies! © Copyright 2018 John Leach Muchelney Pottery - All Rights Reserved.